Audio and sound equipment is defined as any electrical device used to play or record sound; this includes turntables, MP3 players, sound mixers, microphones, speakers, stereo equipment and similar devices. This market, most of which falls into the consumer electronics industry, also includes hi-fi products. Nowadays, new technologies both bolster and compete with established audio equipment retailers. On one hand, audio equipment has improved and such equipment is increasingly compatible with other electronics. On the other hand, consumer electronics, cars and other products have improved audio systems built in, making audio equipment an increasingly discretionary purchase. The U.S. is a profitable market for the audio and sound equipment industry. 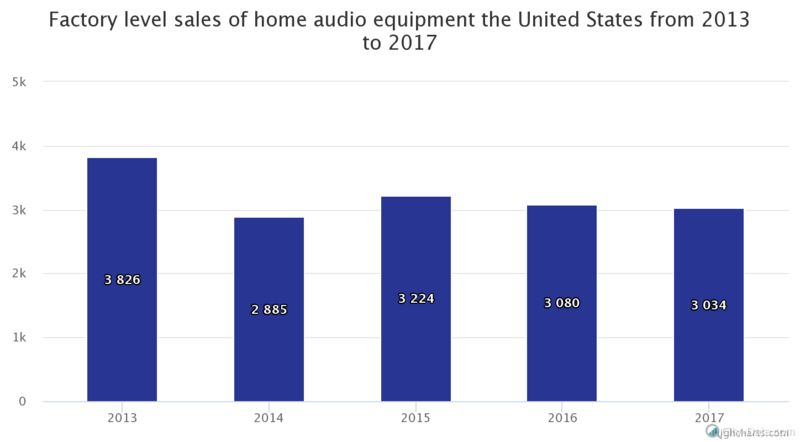 The Consumer Technology Association previously published statistics on the factory-level sales of home audio equipment in the U.S. from 2015 to 2017 — as you can see on the graph below, factory-level sales of home audio equipment amounted to $3.224 billion in 2015. In 2016, sales of home audio equipment dipped to $3.080 billion; 2017 saw a smaller drop in sales, amounting to $3.034 billion. Next, let’s look at the breakdown of sound gear retail sales by product category in the U.S. in 2016; in that year, microphones took the largest share of sound gear retail sales (36.36 percent), making them the most popular audio equipment device on the country. Speaker enclosures accounted for 31.64 percent of sound gear retail sales in the same year, while mixers took a 13.85 percent share of sound gear retail sales. Cables and power amps took 10.2 percent and 7.94 percent shares respectively.